A guide to hooks, their sizes and how we use them at Selectafly. Following a recent email from a customer who was, understandably, confused by hook sizes we thought it might be worthwhile taking a moment to explain our approach to sizing, which hooks we use, and why. It is most certainly NOT a case of one size - or shape - fits all! Wet flies and nymphs are tied on a Kamasan B175. This hook is strong and reliable and is probably the most popular choice for tying these types of fly in the UK. The majority of these traditional wets and nymph patterns are available in sizes10, 12 and 14. Our dry flies are tied on a hook with the same size and proportions but made with a lighter gauge (thinner) wire - the Kamasan B170. A heavier hook would tend to sink these floating flies. Whilst big, juicy flies such as daddies or mayflies will be offered on size 10 hooks, most dries will start on a size 12 hook, dropping down as small as 18's. Lures - such as the Dawson's Olive or Black Tadpole - are normally tied on a longer shank hook - the Kamasan B830 is very widely used and it is our choice for this style of fly. A size 10 of this style looks a lot bigger than the shorter shanked B175, but is more suited to the larger lure patterns. Some lures are also available on size 8 hooks. Our Blobs are tied on a different hook style again. This time we have used the Kamasan B160, a short shank hook with a wide gape, which is appropriate to a Blob style fly. The point of a hook with a narrower gape would be shrouded by the Fritz body, leading to poor hook up ratios. We generally use the size 8 of this unusually small (see the photo) hook, in keeping with the trend towards slightly smaller, neater Blobs - and comfortably inside 'International Rules' for those who are concerned by such things. Finally, our new Czech nymphs and many Buzzers are tied on the curved shank B110, which is a hook specifically designed for these flies. The same hook shape but with lighter wire (the B100) is what we use for Klinkhamer dry flies. 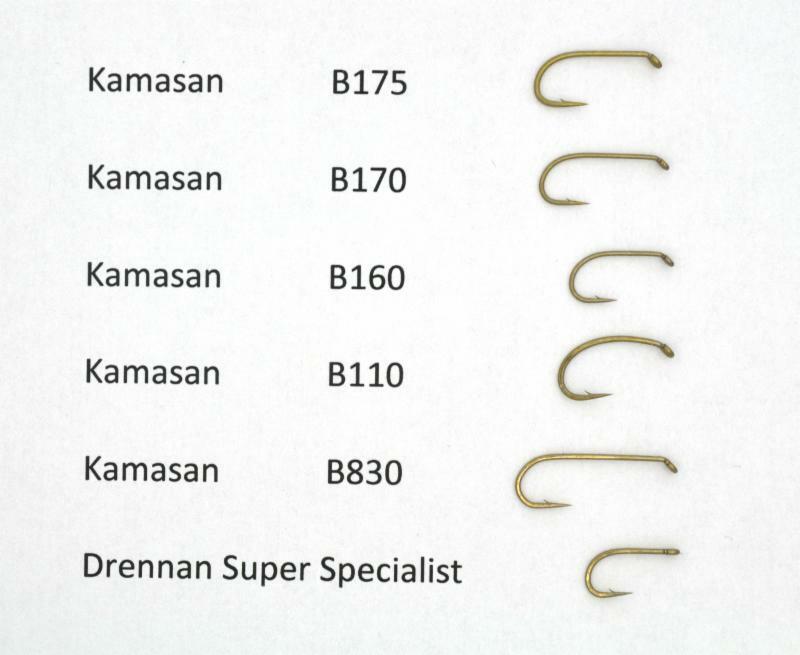 All the hooks in the photo below are size 10, except for the B160, which is actually a size 8! (we call it a 10 on our website because we believe that makes more sense) Also shown at the bottom, just for interest and because that was what triggered the original question, is a typical hook used for coarse fishing, again it's a size 10. The hooks used in our Pro Range follow the same principles as above, using premium quality Tiemco hooks. Our own Selectafly Barbless Range uses various specially designed Barbless hooks - as appropriate to each style of fly. We believe that these specialist hooks significantly outperform regular hook styles without barbs.